Click on the tool bar; or from the File menu, select Print Preview. Click on the toolbar; or from the File menu, select Print; or press Ctrl+P. 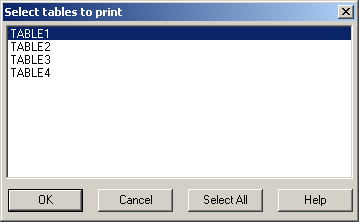 When the printer menu is displayed the important part in the Print Range section that determines what is to be printed. All – All pages of all tables. Current Page – Page currently displayed in window. Current Table – Table containing the currently displayed page. Pages – Range of page numbers for printing. 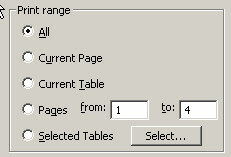 Selected Tables – for this option click the "Select …" button to its right. A secondary menu is presented for table selection. Other options will be included in the Print menu such as the number of copies to be printed. These options affect how the tables will be printed but not what will be printed.